Now that it’s cooler out, I like to make huge pots of soup several times a week. They’re not only great for several nights of dinners, but I love having the leftovers to pack for lunch. And, most freeze well, too. 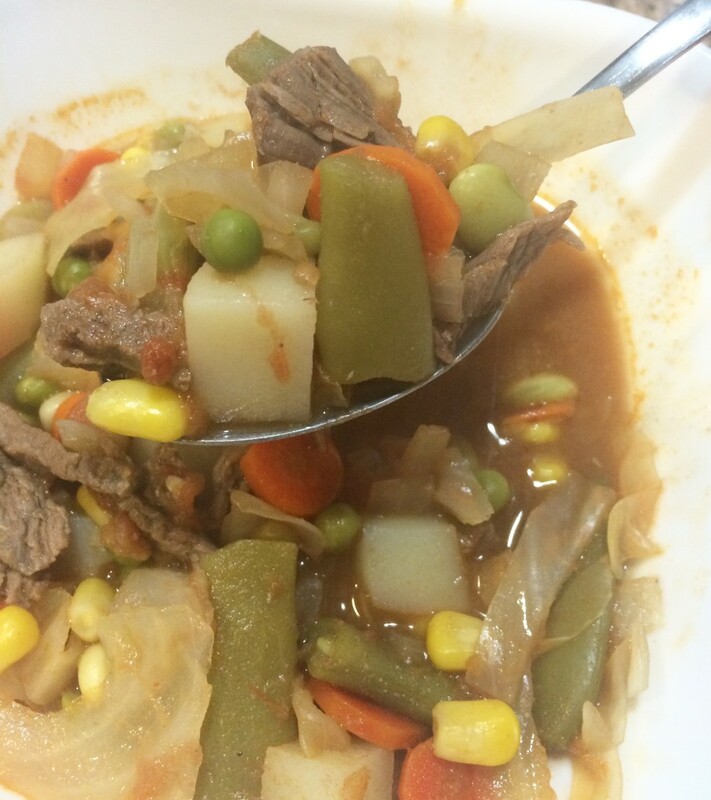 This beef vegetable soup recipe came from my grandmother and is one of my favorites — it’s hearty, healthy, and so delicious, plus it feeds a crowd! Serve with slices of fresh bread or rolls — or, my favorite, a cold cheese sandwich — to soak up the broth. Slice the beef into small bite-size pieces. Place in a large pot or Dutch oven, cover with water and bring to a simmer. Cook until no longer pink, about 10 minutes. Add the carrots, potatoes, onion, cabbage, and tomatoes. Bring to a simmer, cover, and cook until tender, about 25 minutes. Add the frozen vegetables, and cook until tender and heated through, about 10 minutes. (Add about 1 cup additional water if needed). I hate wasting any food, which means I often have to get creative with using leftovers. Hence, this creation. 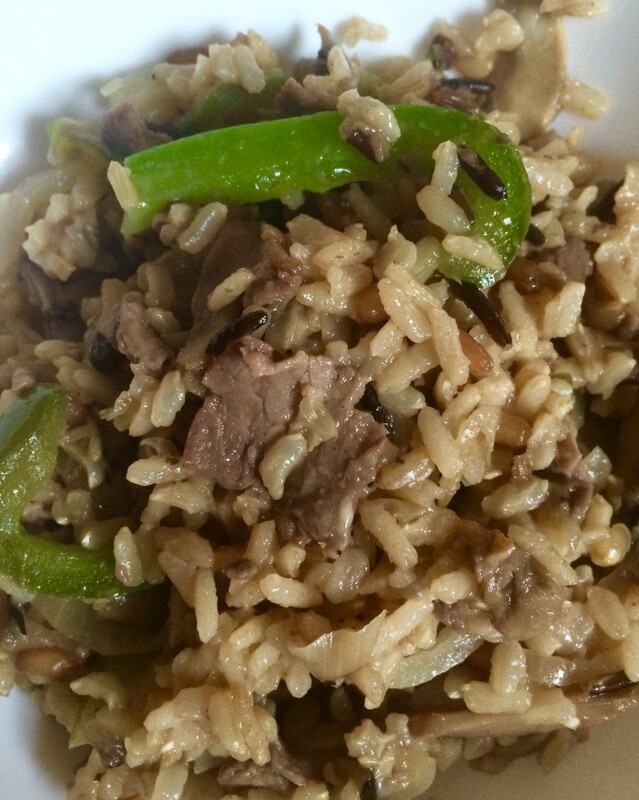 I had a small piece of steak left from last night, so I rummaged through the pantry and refrigerator, cooked some wild rice, sautéed some veggies with the leftover sliced steak and voila, a super delicious and easy way to make a small piece of steak go a long way. Add broth and rice to a medium sauce pan. Bring to a boil, cover, reduce to a simmer, and cook until tender and broth is absorbed, about 45 minutes. In a large skillet over medium heat, add the olive oil and butter. When the butter is melted, add the bell pepper, onion, and mushrooms and sauté until soft, about 10 minutes. Add the minced garlic and steak and sauté for about 2 minutes, until the steak is hot. Stir in the Worcestershire sauce. Add the cooked rice and parmesan cheese to the skillet and gently stir to combine. I love these mini lasagnas. 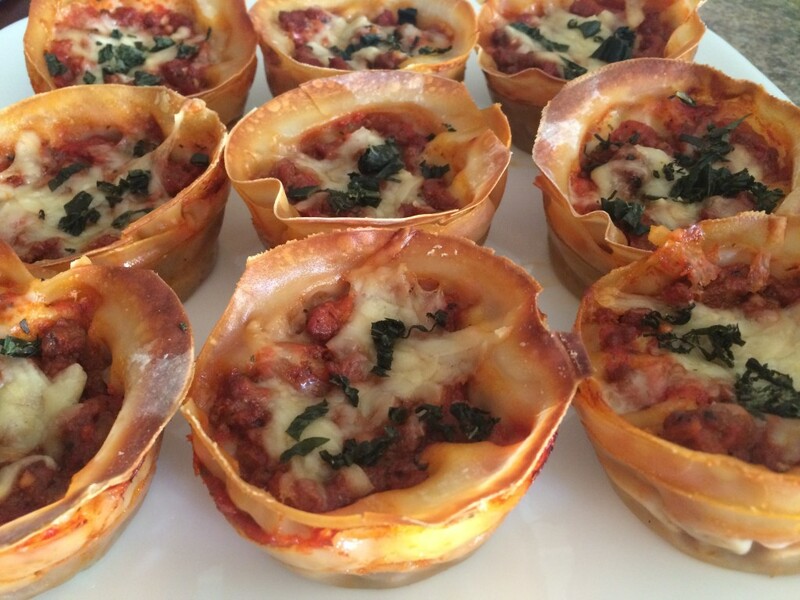 They’re cuter, more fun to serve and eat, and take a lot less time to bake than a traditional pan of lasagna, but they have all the same flavors. I also like that the pasta layer is actually won ton wrappers, so they’re lighter and you don’t feel as guilty eating them. (If you’ve never bought won ton wrappers before, they’re typically in the produce department of grocery stores, in the refrigerated section.) These are a favorite for a weeknight meal or as a heavy hors d’oeuvre, and it’s easy to make them vegetarian by omitting the meat sauce and using marinara instead. Heat 1 tablespoon of olive oil in a large skillet over medium-high heat. Add the ground beef and diced onion, and cook until the meat is no longer pink. Drain off any liquid, and season with salt and ground black pepper. In a saucepan over medium heat, add the other 1 tablespoon of olive oil. Add the minced garlic, basil, and oregano, and sauté until just fragrant, about 30 seconds. Add the canned tomatoes, sugar, and salt, increase heat to medium-high, and cover and simmer for about 15 minutes. Remove from heat, and with an immersion blender, puree until smooth (or, working in batches, carefully puree in a blender). Once sauce is smooth, return pan to low heat and stir in tomato paste. Add sauce to the cooked beef, and gently stir to combine. In a large bowl, stir together the ricotta cheese, egg, mozzarella cheese, parmesan cheese, parsley, and black pepper. Spray two muffin pans with cooking spray. Layer in each, 1 won ton round, 1 tablespoon of meat sauce, and 1 tablespoon of cheese mixture. Repeat layers once. Then add the third won ton round, top with a tablespoon of sauce, and sprinkle with parmesan cheese. Remove from oven, sprinkle with basil, and let rest in pan for 5 minutes before serving. Use a fork to gently pop each lasagna out of the pan. If you prefer to use store-bought sauce, you'll need about 3 cups.